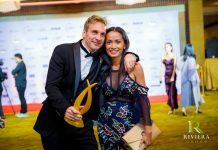 Kobi Elbaz and the Tulip Group held a party at the Centara Grand Phratamnak hotel on Thursday, March 20 to celebrate the ongoing construction of the company’s Waterfront Suites & Residences project at Bali Hai in Pattaya. Over 120 guests were treated to dinner at the Oceana restaurant followed by drinks on the rooftop overlooking the bay. Waterfront is a project that was initially conceived a number of years ago and went through many early problems before finally getting off the ground after being purchased by the Tulip Group and Park Plaza Hotels. The location however is a developer’s dream, situated near the iconic Pattaya sign and with sweeping views of the bay and outlying islands. 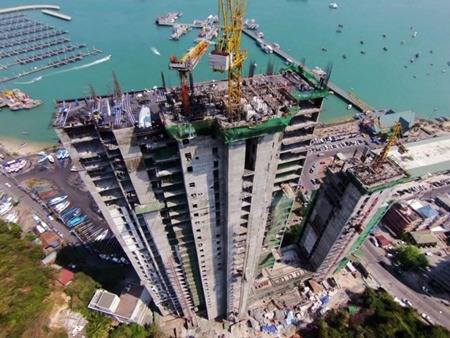 Tulip Group celebrated the joining of the 2 main towers of its Waterfront Suites & Residences project at Bali Hai in Pattaya last month as construction crews hoisted a 5-storey bridge unit into place. 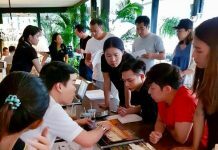 Tulip CEO Kobi Elbaz explained that it’s an amazing plot of land and the project is now selling for record breaking prices, with a unit recently purchased for an incredible 246,000 baht per square meter, while many others in the building are selling for 200,000 baht a square meter. 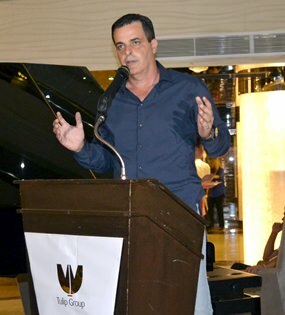 Tulip CEO Kobi Elbaz updates guests at the March 20 party on progress of the Waterfront Suites & Residences development. Mr Elbaz stated that the obligation was totally on Tulip Group as the developer to get things right and deliver on time, which is why the company put so much effort in from day one. This time last year the piling work had just been completed and now, just twelve months later, 35 floors on the condominium side have already been finished and 22 on the hotel side. 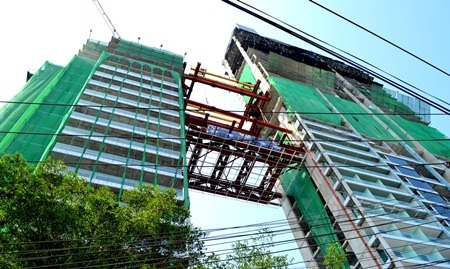 On the morning prior to the party last month, a blessing ceremony took place at the Waterfront as construction engineers installed the biggest bridge ever assembled in a single building in Thailand. The design of the building is both complicated and unique, with the bridge sitting between the two towers 60 meters from the ground and containing five floors of hotel rooms plus a swimming pool on top. Currently construction teams are working 24 hours a day, 7 days a week, and are completing a floor every four days. The aim is to finish 53 floors by the end of July. Tulip Group prides itself on being able to deliver projects ahead of schedule, and in the case of Waterfront the contract with its clients is to complete by the end of 2015. With the current pace of construction however, it is likely that the main structure of the building will be finished by the end of this year and it is hoped that the hotel side will be open in time for the high season at the end of December. At present, 15 floors have been fitted with glass and aluminum wall tiles plus air conditioning and 15 more will be completed over the next three months. The 5-star hotel will have 128 rooms while the condominium building will house 301 units with access to the full facilities of the hotel, which include restaurants on the 21st & 22nd floors, a coffee shop on the 3rd floor next to the swimming pool and another restaurant on the lobby level with amazing views. 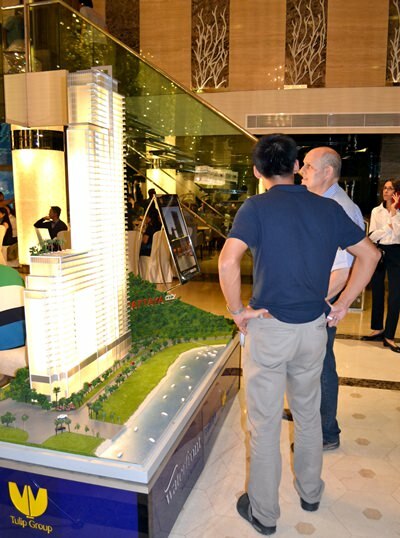 Party guests view a scale model of the project.